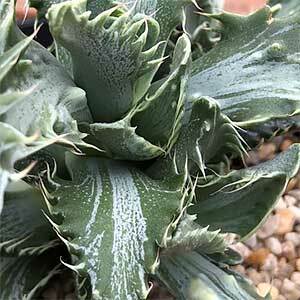 A group of succulents that are becoming more popular are Faucaria. The common name is Tiger Jaws, referring to the toothed margins of the foliage. Leaves are triangular in shape, fleshy, and tend to curve inwards. Flowers range from white through to pinks. Active growth is from spring to summer, and this clump forming group of succulents are easy to grow in containers. The foliage is often mottled or patterned and the best of these are the most popular forms. The only real problem these succulents have is stem rot, so if you water sparingly and have a good free draining potting soil you will have few problems. Best grown in bright filtered light with direct sun in the morning. In very hot climates, more shade will be required. A well drained soil is essential. When in active growth, water every week allowing the soil to drain and dry a little between waterings. Flowers will not open in very low light or on very cloudy days. F. tuberculosa has white tubercles on the level and large yellow flowers. F. candida has well formed triangular leaves and white flowers. F. bosscheana has yellow flowers the leaves being unmarked. F. paudicens is very similar to the above.